Radix Panax ginseng grows primarily in East Asia. Traditionally, the ginseng root is used for boosting energy and natural defences, for increasing physical and mental performance, as a general tonic for fatigue and as an aid to overcoming stress. 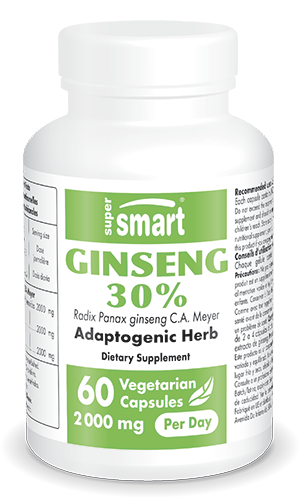 Taking ginseng supplement pills thus helps the body adapt to active, modern life, by generally boosting resistance and increasing physical, mental and cognitive ability. With a regulating effect on certain organs (in particular, the hypothalamic-pituitary axis and adrenal glands) and on multiple physiological functions - while not over-stimulating or restricting normal functions - ginseng supplement pills acts as a general tonic without producing any ‘rebound’ effect. It is particularly beneficial for the central nervous, immune and cardiovascular systems, for neuro-endocrinological function and for the metabolism of carbohydrates and fats. Radix Panax ginseng C.A. Meyer is the only ginseng registered in the pharmacopaeia. Its mechanisms of action are by no means fully understood but its therapeutic benefits have been attributed to its active principles, ginsenosides. These act via different pathways and it is thought each may have its own tissue-specific effects. Ginseng’s ginsenoside content varies according to the plant species, age, part of the plant used, time of harvest and method of preservation and extraction.